4 BRs + 5th Sleeping Den, 5 Full Baths (Sleeps 10) On the beach path ! LOCATION . . . LOCATION . . . LOCATION . . .
64 MOORING BUOY, ON THE BEACH PATH. SECOND HOUSE TO THE BEACH. When you spend your Hilton Head Vacation in our home you are only 'steps' from the most fabulous beach in all of South Carolina. Located in the exclusive Gated Palmetto Dunes Resort community, this home is the second home from the beach, steps to the beautiful Atlantic Ocean & private, crystalline beach, on the beach path. A one minute walk to the beach, The address to this Vacation Home is 64 Mooring Buoy. A low-country-style home, with a large southern front porch complete with ceiling fans and rocking chairs. The main level has a large, open floor plan, the great room consisting of the living room, with HD-TV, dining room, breakfast room , and fully-equipped, updated kitchen. Continuing on the main level are two identical master bedroom suites, each with a king size bed, HD-TV, large walk in closet, new renovated, 2018 large master bathrooms, with Jacuzzi tubs, double sinks/vanities, and walk in showers. In addition, on the main level, is a beautifully decorated private comfy den/5th bedroom, sleeper sofa, fireplace, bar, & HD-TV. Also on this level is the full cabana bath with shower, laundry room, full sized washer/dryer, screen porch and large upper deck. The entire back of the house overlooks the beautiful grounds & outdoor pool/spa. The second level of this spacious home you will find the large open loft area, The Sailboat Bedroom and the Lighthouse Bedroom, each bedroom has two twin beds and each having full baths with showers. The open, spacious, floor plan, makes this house a very pleasant and comfortable place to spend your Hilton Head vacation with friends & family. Your initial approach to this house is through the u-shaped driveway with plenty of parking for you and your guests. The sparkling Pool/Jacuzzi are surrounded by a tropical professionally landscaped haven & several cozy outdoor sitting areas. Hands on owners - you will never find a cleaner, more equipped house than this "Savannah"
SEE ALL THE REVIEWS, FROM OUR SATISFIED FAMILY OF VISITORS. We have been vacationing in Hilton Head since 1979, renting homes in the same area where our home now stands. 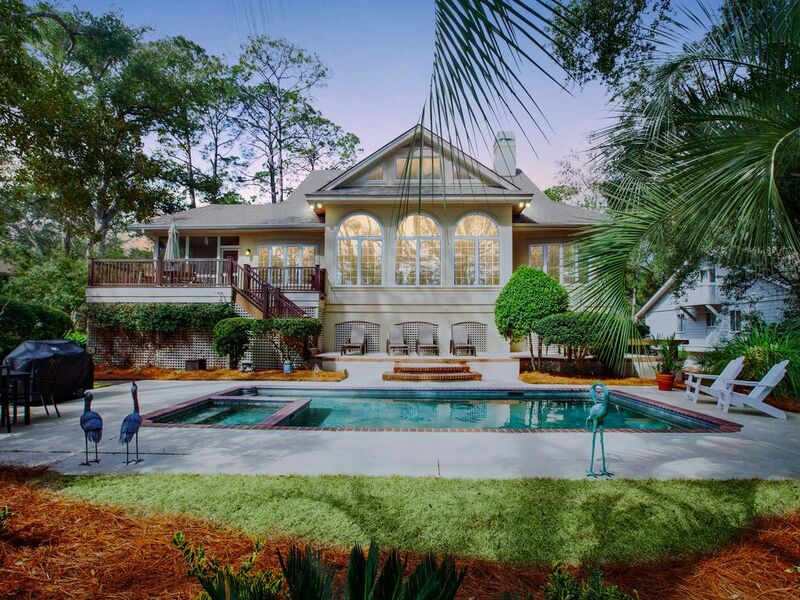 In 1997, it was time to build our dream home on Hilton Head Island. We decided that it had to be in Palmetto Dunes. We found the perfect piece of property, located directly on the beach path, our home is only steps to the beach. The walk to the beach takes less than one minute! Our children were just little ones when we first discovered Hilton Head Island.They are both grown, they still enjoy the island and vacation on Hilton Head with their families. They have made wonderful memories of summers on Hilton Head & cherish and enjoy the beauty of the Island. Our guests find our home very comfortable and inviting. There is everything you will need to have a memorable stay. The pool is one of the largest pools on the island, and it is surrounded by lovely, lush professional landscaping. There are 3 outdoor seating areas, a cozy and charming screened in porch, and my favorite is the country style front porch. I love sitting in the rocking chairs while enjoying the beauty of Hilton Head. Our home is "spotless", updated regularly, and is large enough for two families to share. There are two master bedroom suites, (4) tv's, master size walk in closets, master baths with jacuzzi tubs, separate stall showers and double vanities. The great room consists of the living room area, the dining room area with seating for eight, the adjacent kitchen nook with seating for four, and the kitchen counter bar. There's enough room for everyone all together. On the second level there are two additional bedrooms each having (2) twin beds, and each having their own private bath, with tub/shower. There is a private 5th bedroom/den off the great room, there's a the laundry room with full size washing machine & dryer, and a 5th full bathroom off the kitchen area. Off the kitchen you can find the lovely screened in porch, which leads to the upper deck. The entire back of the first level of the home overlooks the pool, the deck and the beautiful landscaped grounds. I love walking to the beach in the early morning with my coffee. I sit on the beach steps & enjoy the view. It is very relaxing. Beach bike riding is a favorite for all, Palmetto Dunes beach is beautiful for long bike rides. In addition, the street bike path runs through Palmetto Dunes. I can promise you, that you will love the stay in our home. We have several families who return every year. Total 5 full bathrooms. Each master bedroom, is a master suite, with brand new 2018 master bathrooms, jetted spas tubs, walk in showers, double vanities on the main level. The 2nd level has two additional bedrooms, both with 2 twin size beds, full size bathrooms with showers. Also on the main level, is the 5th full bathroom with shower. Location, Location, Location, 64 Mooring Buoy is directly on the beach path to Palmetto Dunes Beach. The walk takes less than one minute. We are the second house from the beach, only 150 steps. You can grab a peek at the ocean from the second level. Two Central Air Conditioning Units. All linens provided, including sheets, pillow cases, bed pillows, blankets, kitchen dish towels, bath towels hand towels, face cloths. We do not supply beach towels. Full size clothes washer & dryer in separate laundry room, directly off kitchen. No on Street Parking allowed. Plenty of parking area in the U-Shape driveway. Two car attached garage. Large U-shaped driveway parking at least 5 cars. We have Wireless Internet Service. Large great room, consists of living area with large HDTV, dining room, kitchen, with counter bar, and kitchen dining area. Great flow for entertaining. Large Pantry Closet - Stocked with extra large pots, serving trays, large containers, baskets. Store all your groceries, cases of water, soda, beer. Fully equipped kitchen. Everything you will need in this kitchen and the entire house is there. We keep everything updated and in excellent condition. We are hands owners & want our home perfect for you! (2) large screen HDTV's & (2) more HDTV's in master bedrooms, stereo, VCR, DVD Inside/Outside speaker system & Wi-Fi internet. Books located on the second level in the bookcase in the loft area. Several games located on the second level in the bookcase in the loft area. Beach toys, pails, tube, noodles, rafts, boogie boards located in the garage. Lots of great movies to enjoy. 2019 - Newly constructed upper deck, off the kitchen area with large seating area. Upper deck overlooks the pool and landscaped grounds. Bike, Canoe & Kayak rentals available at Outfitters located in Palmetto Dunes. There is a beautiful lagoon system for recreational water travel. Huge country style front porch, complete with rocking chairs and ceiling fans. There are 3 outdoor sitting/eating areas around the pool, one on the upper deck; and 2 pool side. Don't forget the huge country style front porch, a favorite place for sitting and relaxing. Palmetto Dunes has 3 professional golf courses. Arthur Hills - Robert Trent Jones - Fazio, all within the gated community of Palmetto Dunes. Heated Private Pool is 16 x 32, Heating for the pool is optional. The is surrounded by beautiful, professional, lush landscaping. Large private pool has private hot tub/spa, with beautiful professionally landscaped grounds surrounding the pool. Two Zone Air Conditioning, Cable - HD - TV(s), DVD/VCR/CD/Radio, Indoor/Outdoor Speakers, Fully-Equipped Kitchen, Full size Washer/Dryer, *Heated Pool with Jacuzzi, Weber Gas (BBQ) Grill, *Pool/Jacuzzi Heat optional *This is a non-smoking home. PALMETTO DUNES IS A GATED COMMUNITY CENTRALLY LOCATED ON HILTON HEAD. THE WORLD CLASS PALMETTO DUNES TENNIS & PICKLE BALL CENTER, 3 CHAMPIONSHIP PALMETTO DUNES PLANTATION HAS 3 CHAMPIONSHIP GOLF COURSES, MILES & MILES OF WONDERFUL BIKE TRAILS, THE BEST & MOST PRISTINE BEACHES YOU WILL EVER FIND, 100'S OF FABULOUS RESTAURANTS AND THE BEST FAMILY VACATION DESTINATION EVER.